If you can’t reach me during lunchtime, there’s a good chance I’ll be at my new favorite eating spot, Sweetsalt Foodshop. Located at the entrance of Toluca Village, on Riverside Drive, there are so many good choices on the menu that it seems almost impossible to tire of this bright new cafe. 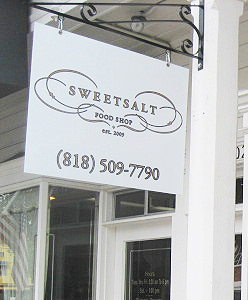 Open just over a month, Sweetsalt has already become a popular dining experience in the neighborhood. Sweetsalt is a labor of love for owner and chef Alex Eusebio. The former Top Chef contender (Season 5) from New York says he’s been put off with some of the new wave of cooking, and that everything is too much, and too overdone. Instead, his idea was to do something more “homegrown.” Using this as his inspiration, Eusebio teamed up with his wife, Sara Mann, to create a restaurant that is much more than a sandwich shop. Both can be found working side-by-side in the restaurant, along with friend and chef Jaime Chavez. Eusebio’s innovation is shown in his hands-on approach to everything. As he says, “good technique shouldn’t cost a lot of money.” Eusebio has done a good job of being true to his word. Although there are labor-intensive items on the menu, they have managed to keep their prices low. Prepared salads run $7 for a good-sized portion, and sandwiches ($8-$10) can easily be split between two people. Housed is an old box store, the owners have also done wonders in creating a cute, intimate space that’s a cross between turn of the century design, and Martha’s Vineyard. With dark hardwood floors, Carrera marble tabletops, wainscoting, antique-looking fixtures and baskets, you just might think you’ve left the Valley. A massive antique gold picture frame holds the chalkboard that lists the daily specials, cheese and desserts. It’s order at the counter and only six tables inside, but the employees have figured out quickly how to take orders and keep things moving. Everything is made fresh, so if you have a large take out order, it’s probably best to call ahead. 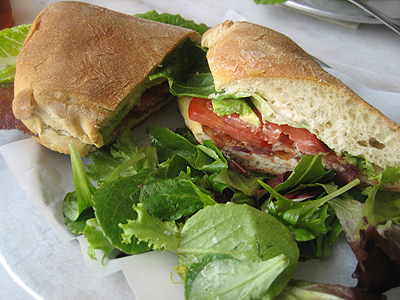 The small café also doubles as a retail/to-go food shop — think a smaller Joan’s on Third. 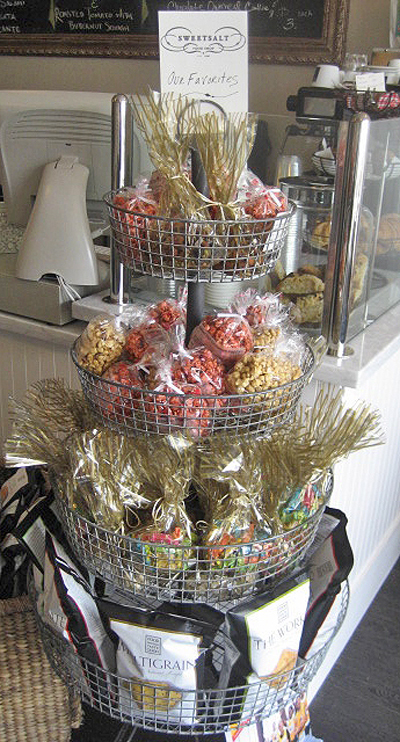 Not only is the design and concept unique to the San Fernando Valley, but Sweetsalt also features unusual combinations that are sure to both tease and delight the taste buds. Many of them, are part of their signature name– the combination of sweet and salt. 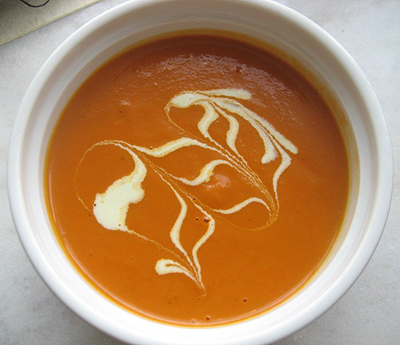 One of the days I visited, the daily soup was a rich and velvety Carrot Caramel. I couldn’t decide whether it was dessert or lunch, but it was enjoyable to the last spoonful. 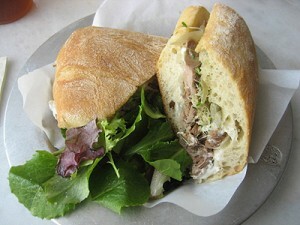 The Lavender Duck Confit sandwich, with duck and onion confit, goat cheese and lavender honey, melts in your mouth. Another sandwich, the Sweetsalt BLT, has both roasted pears and a goat cheese spread along with the applewood bacon, lettuce and tomato. Again, it’s sweet and salt. Another day I had the Short Rib Roll, which was recommended by the Chef. The coffee-braised short rib was delicious, but paired with the onion confit, goat cheese, and roasted garlic—a little too rich for my taste. It came on a beautiful brioche bun, however, that was light and delicious. 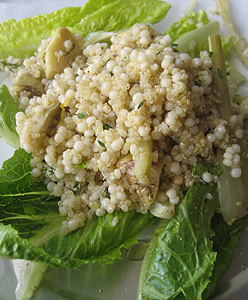 The daily menu also features prepared salads like the Organic Grains, which has quinoa, couscous, haricot vert, roasted fennel, and parsley. On the day I visited they were out of the haricot vert and instead used fresh artichoke hearts. We told the Eusebio and Chavez that we LOVED the artichoke addition. Greens accompany all the sandwiches, and dressings are simple, yet flavorful. You can also create your own organic green salad, and add as many vegetables, cheeses, or poultry as you wish. Daily fresh soups are not always what’s listed on the menu of the day, but they won’t disappoint. Again, they play around with flavors, and adds new varieties every week. In addition to my favorite Carrot Carmel soup, I’ve tried the refreshing Parsnip Lemon soup, and the delicious full-flavored Tomato/Roasted Butternut Squash soup. Other specials include a daily frittata, and a truffle potato salad. 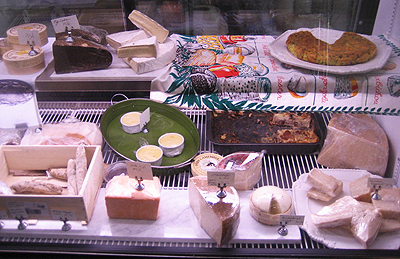 Sweetsalt also has a charcuterie plate with an offering of three different cheeses, a choice of meat, fig paste and a baguette for a mere $15. For dessert there is a Chocolate Caramel Bread Pudding, Chocolate Oatmeal Cookies, and a “Pack Your Knives” Crème Brulee on the menu, but I also saw a plate full of dense chocolate brownies. If that’s not enough to satisfy your craving, ask for the special café mocha that’s made with Mexican Abuelita chocolate. Eusebio says that this opening menu is a work in progress and will be developing, so soon they’ll be even more new things to try. I know I’m going to work my way through this one, so I’ll be ready for the next! 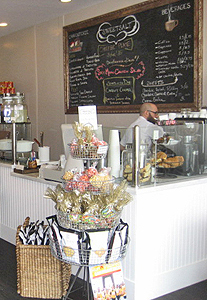 Sweetsalt is located at 10218 1/2 Riverside Drive. 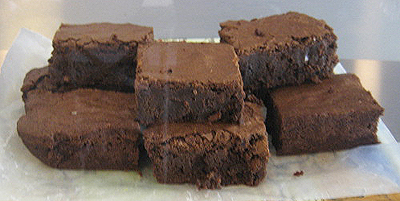 Its’ new hours are 10am-8pm Monday through Friday, and 9am to 5pm Saturday and Sunday.You can see their menu at www.sweetsaltfood.com and find their daily specials on Twitter at http://twitter.com/SweetSaltFood. Kris Kelley Rivera is a former television news writer and producer, and the mother of two boys. She lives in Studio City. Looks wonderful, I can’t wait to check it out! I’m going to take my mom and uncle there next Sunday when they visit from out of town. This is the 2nd time today that I’ve read about the Sweetsalt Food Shop! Something is urging me to head over there this week.